Port forwarding is I can say for experts but it is actually very simple to do if you will just follow these steps below. Before doing that, be in mind that there are different kinds of router out there but generally speaking you should understand the terminology that manufacturers use on their router product for you to be able to configure the port forwarding. 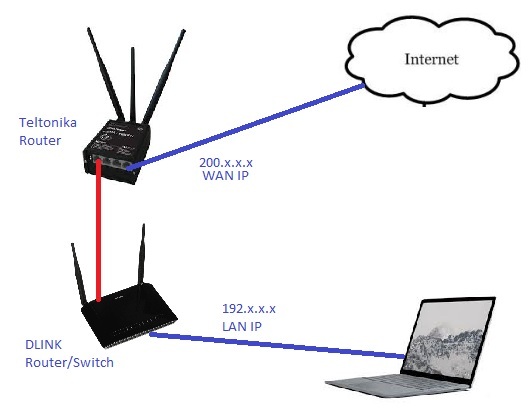 In this example I will use the Teltonika (RTU240) router as the first device that connects to the WAN, and the TP-Link router as the 2nd device that connects to the local network. Dlink Router has DHCP enabled that provides ip addresses to the 2nd LAN (192.x.x.x) devices. 1st Teltonika Router is connected to the internet. Based on my experience, TP-link router (with LTE backup) for instance uses "Virtual Servers" for their Port forwarding setting. Teltonika router (with LTE backup) on the other hand uses the "Firewall" terminology and under this page the port forwarding setting is accessible. Let us assume that we are port forwarding port "80" as internal (from LAN) and we assume to use "8080" as external Port. This will allow us to remotely access the device using a web based link. Assuming that there is already a DDNS setting applied to the 2nd DLINK router. 1. Login to the 1st router (Teltonika), enter the username and password. IP address: IP address of the 2nd Router (DLINK), to find the ip address of the Dlink, you can use IPscanner to the teltonika router network. 1. Login to the 2nd router (D-Link), enter the username and password. IP address: IP address of the device you want to access (e.g. computer, xbox, camera, etc), to find the ip address of the device, you can use IPscanner to the 2nd LAN network. 3. Save your setting and you are good to go. According to the PRC (Professional Regulation Commission) there were 1,361 out of 4,311 successful examiners who passed the Civil Engineer Licensure Examination given by the Board of Civil Engineering in the cities of Manila, Baguio, Cagayan de Oro, Cebu, Davao, Iloilo, Legazpi, Lucena and Tacloban this May 2015. CONGRATULATIONS to all who passed the exam. The complete list of names is listed below. Note: To verify the result, please visit the PRC website. The list is sorted in Alphabetical Order.